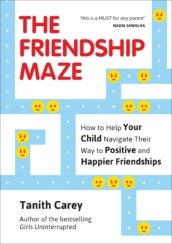 Tanith Carey writes books which offer a lucid analysis of the most pressing challenges facing today’s parents. As an award-winning journalist, Tanith also writes on parenting for a wide range of publications including The Daily Telegraph, the Guardian and the Daily Mail. She is a regular presence on TV and radio programmes, including the NBC Today Show in the US, Radio Four Woman’s Hour and You and Yours, This Morning, the Lorraine show and Good Morning Britain.